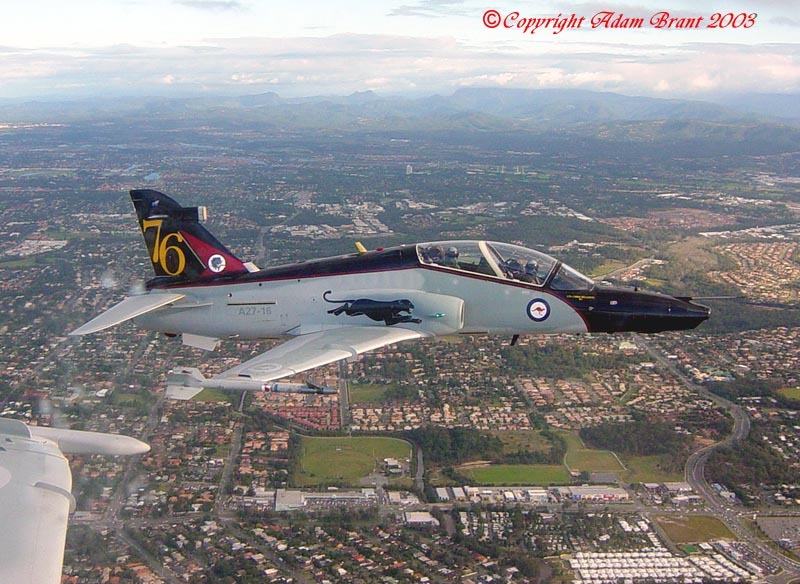 Additional photos by Adam Brant. 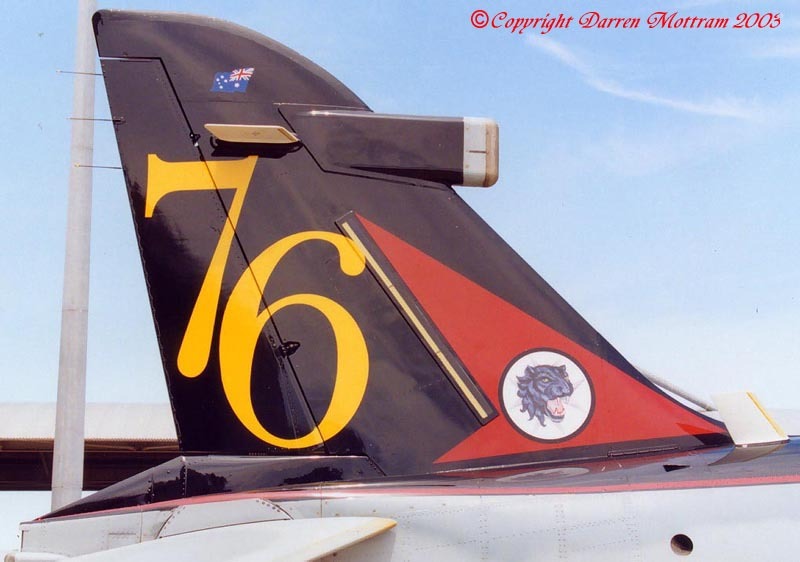 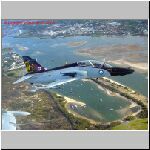 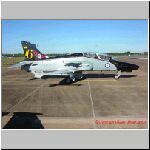 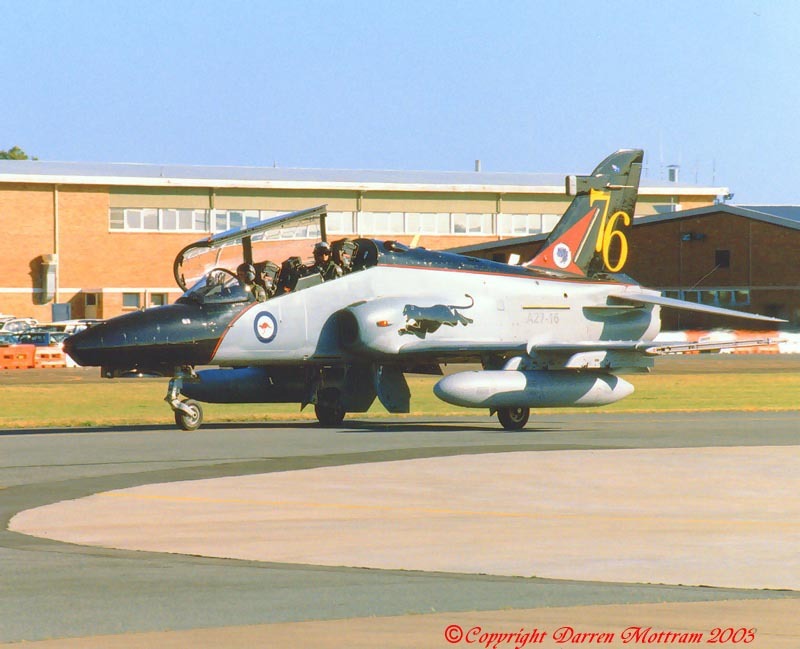 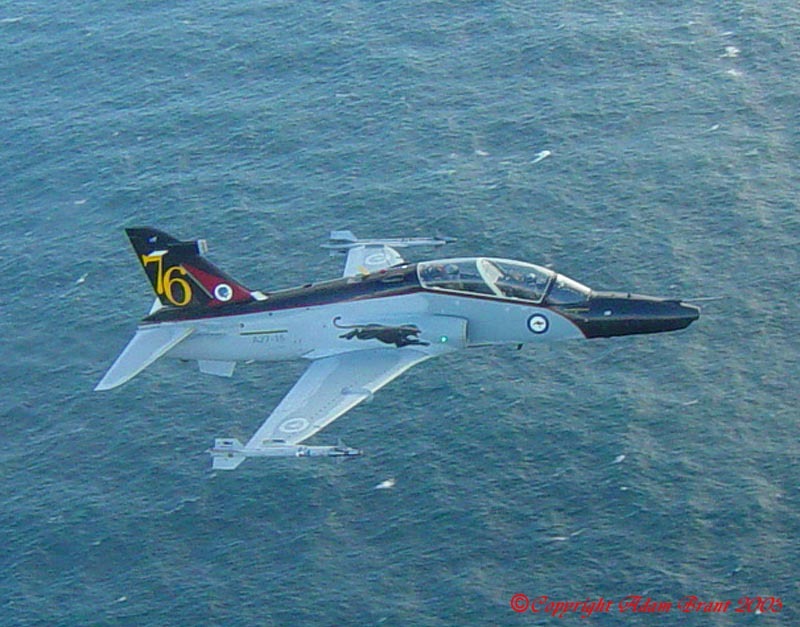 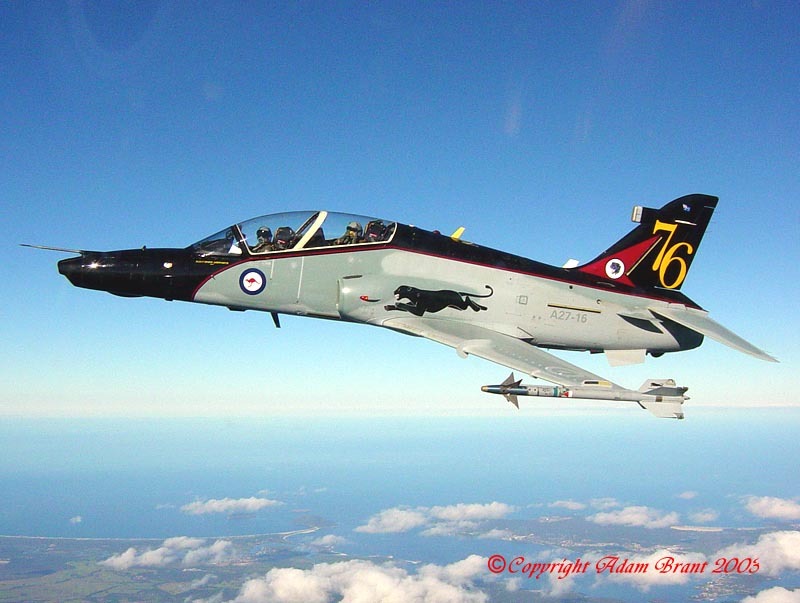 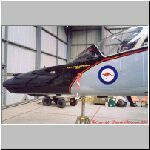 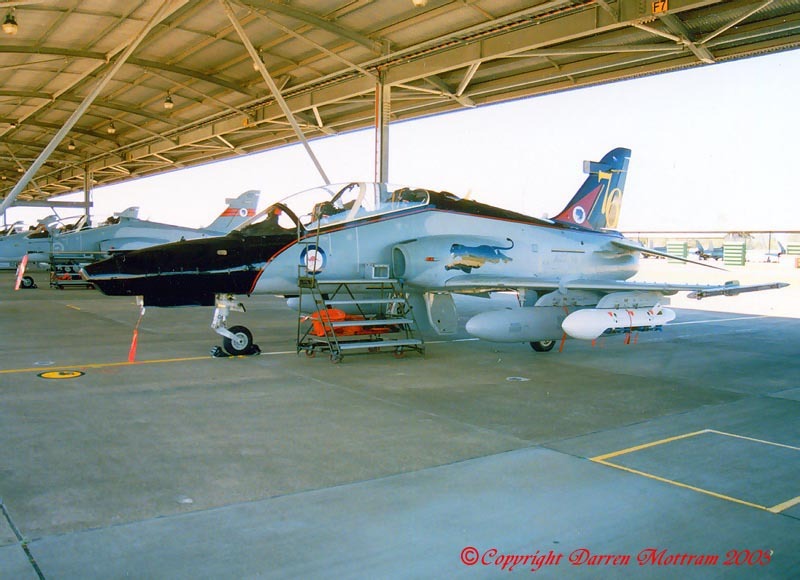 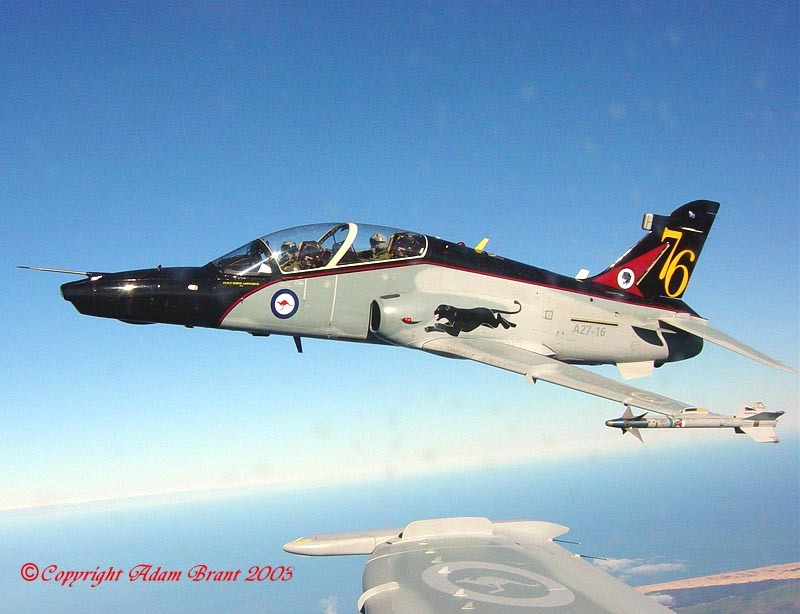 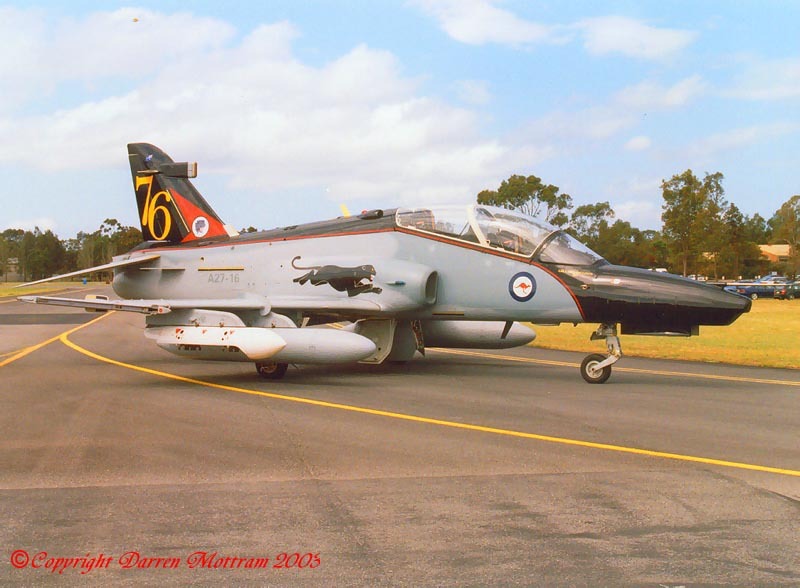 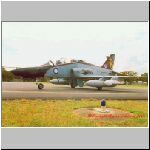 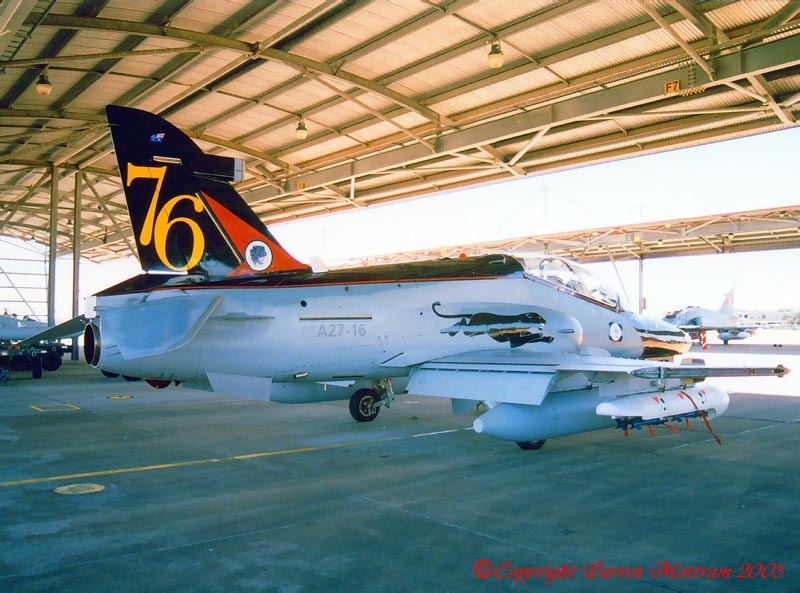 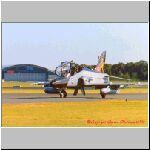 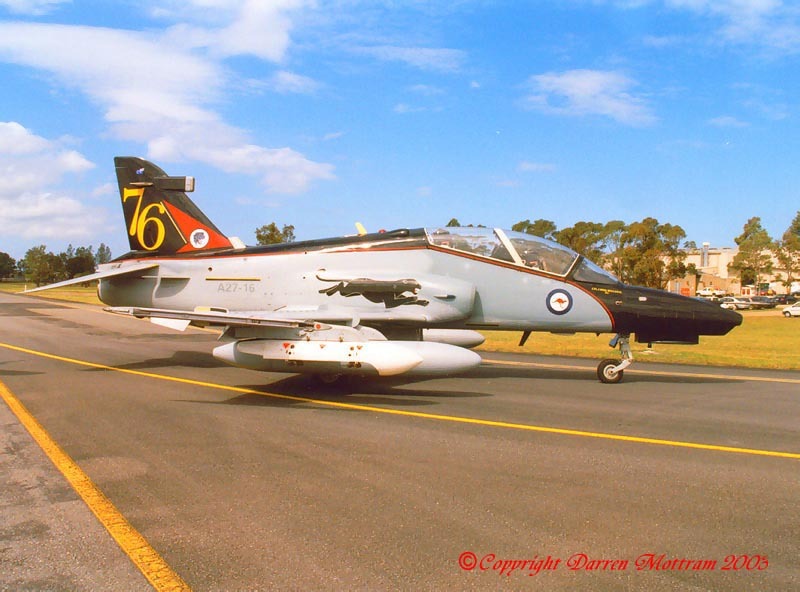 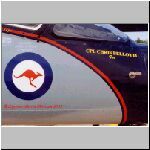 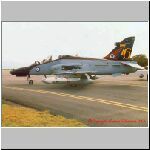 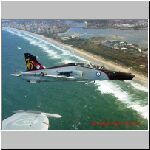 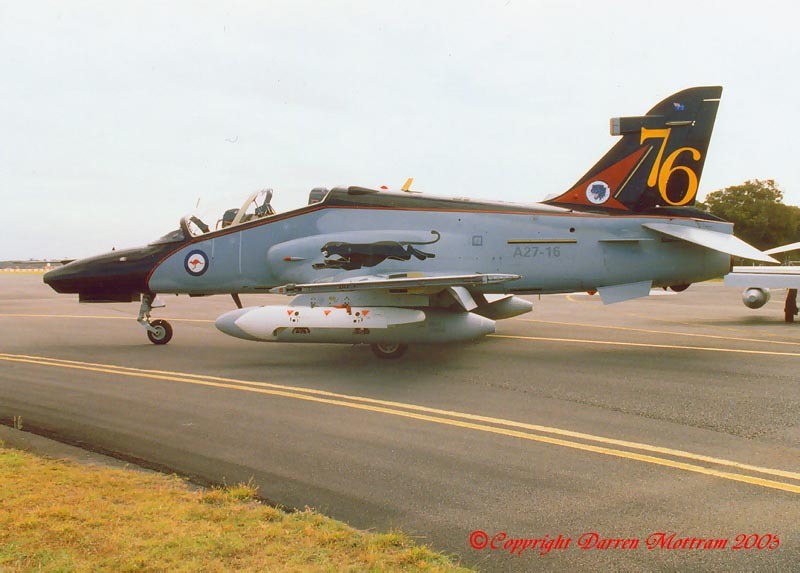 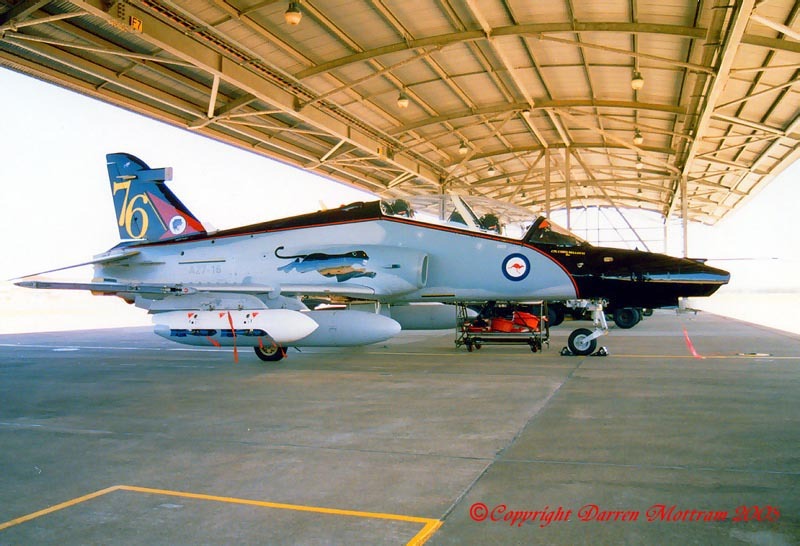 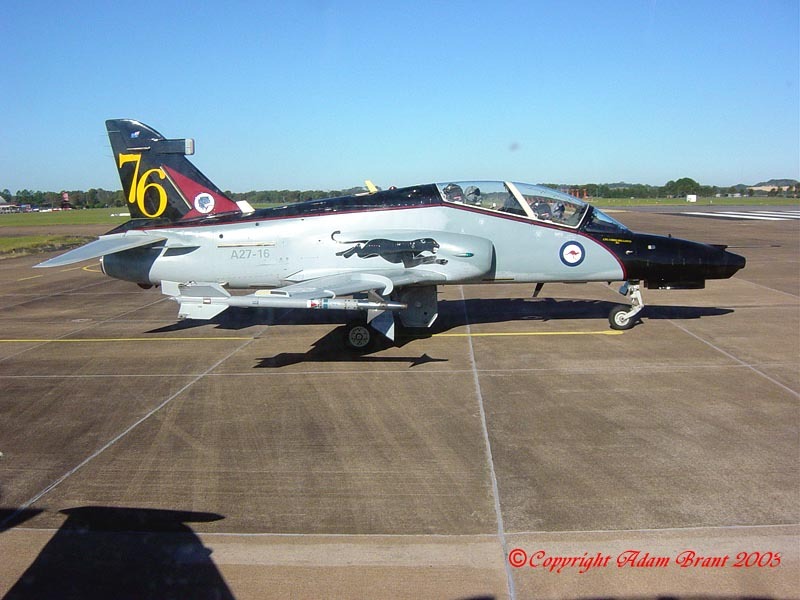 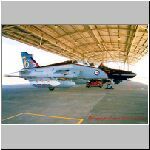 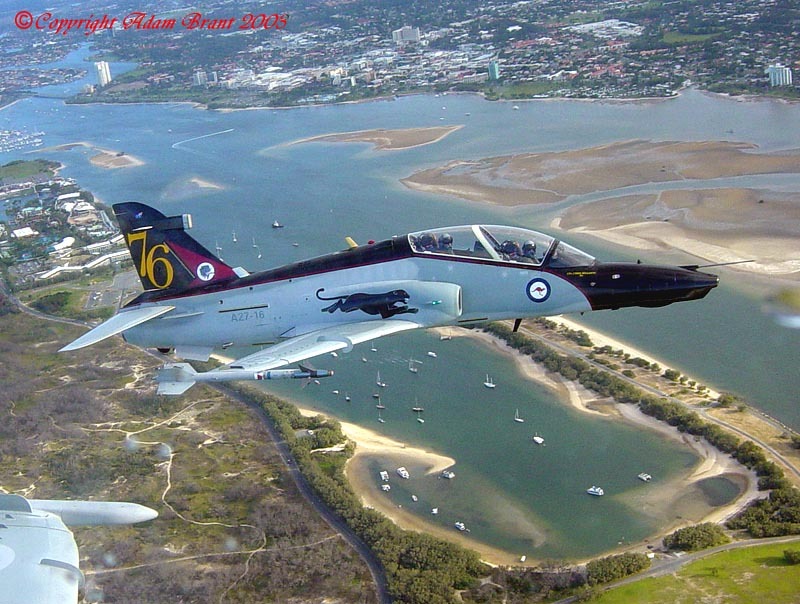 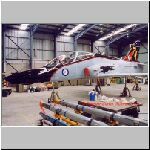 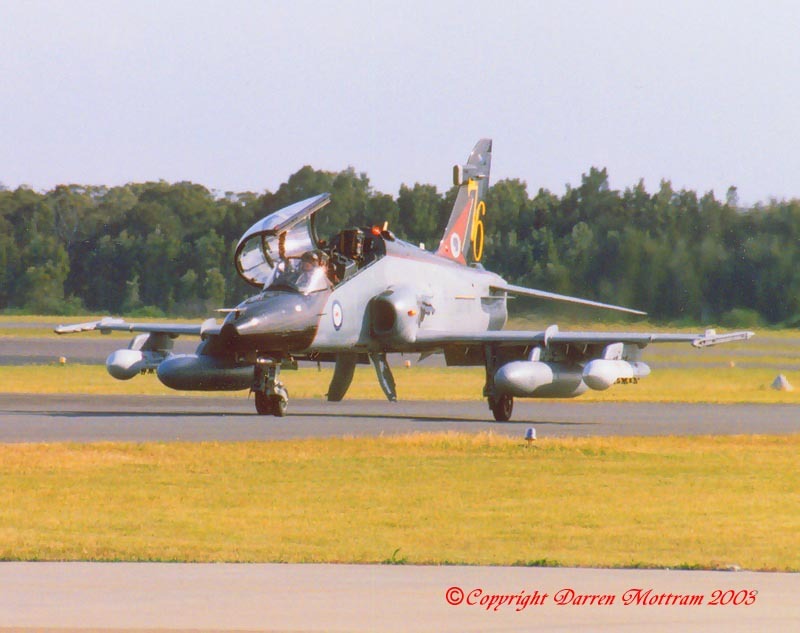 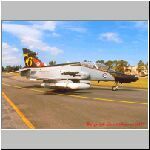 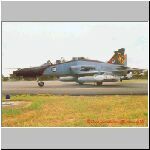 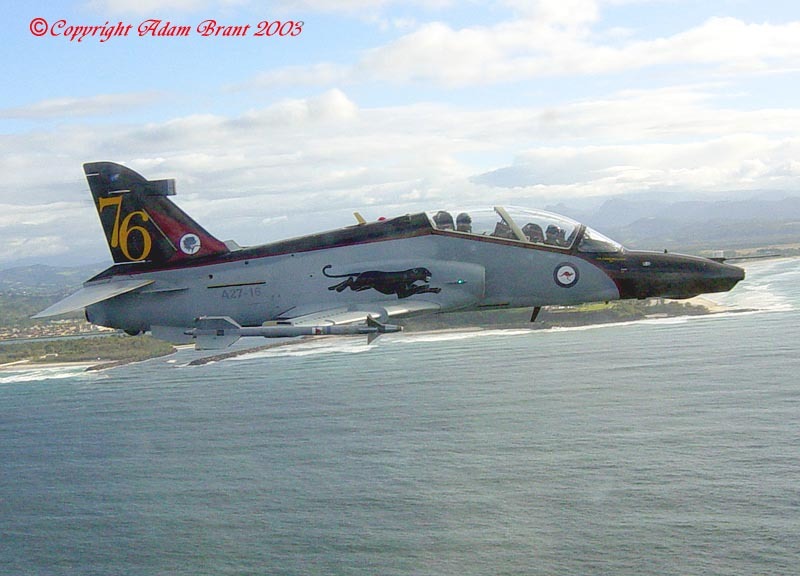 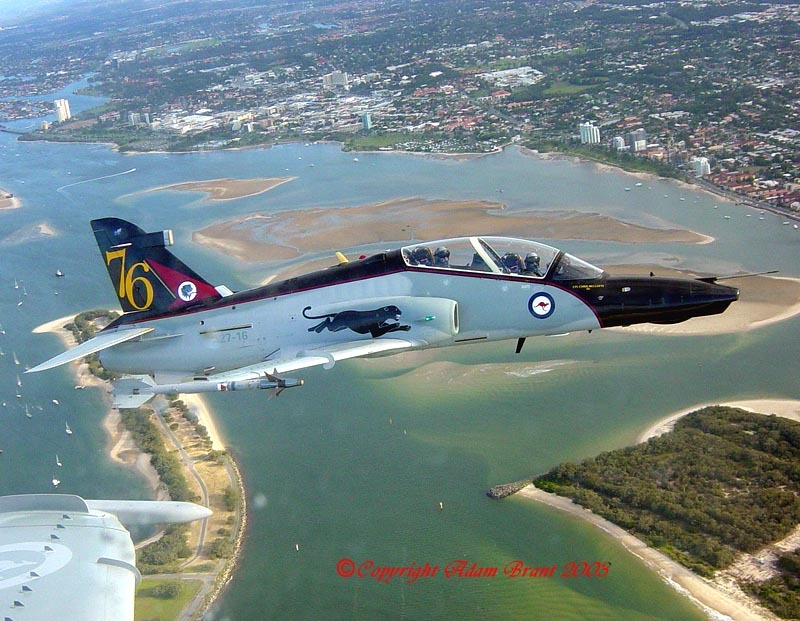 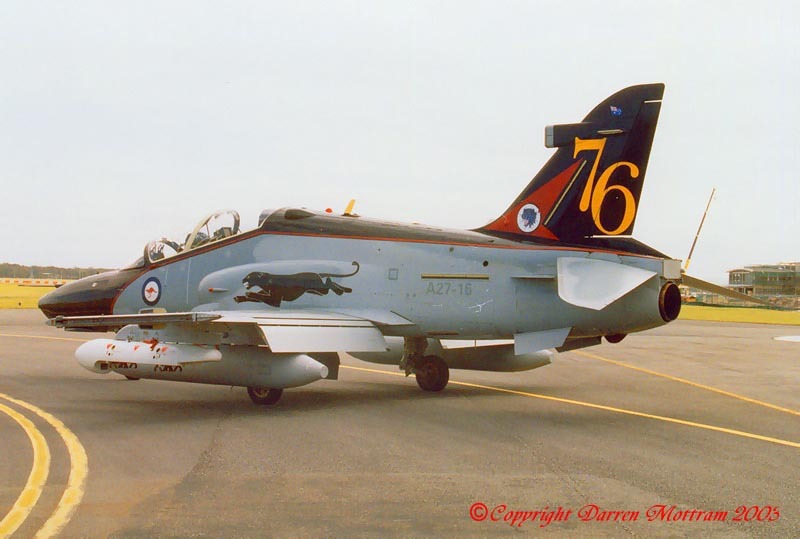 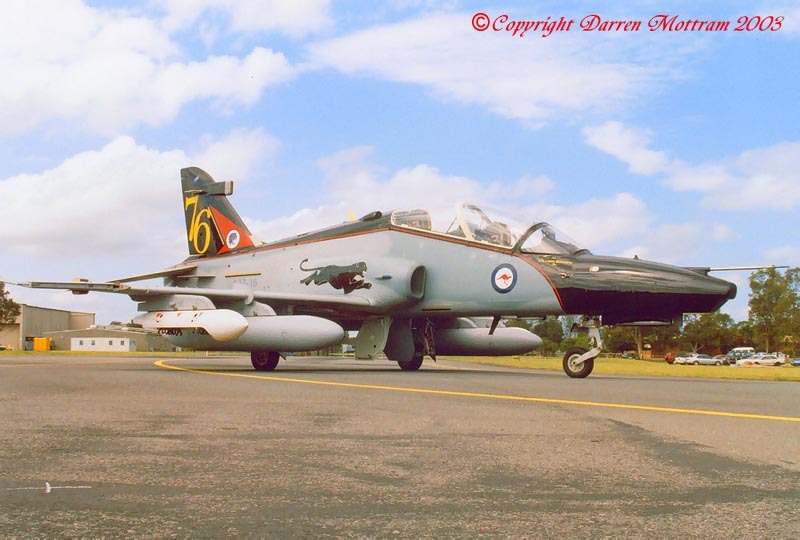 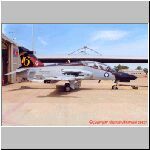 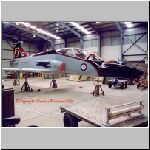 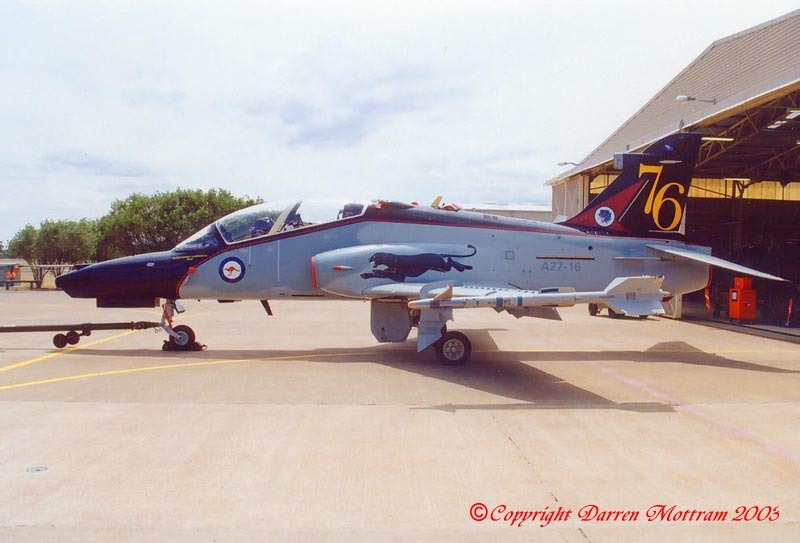 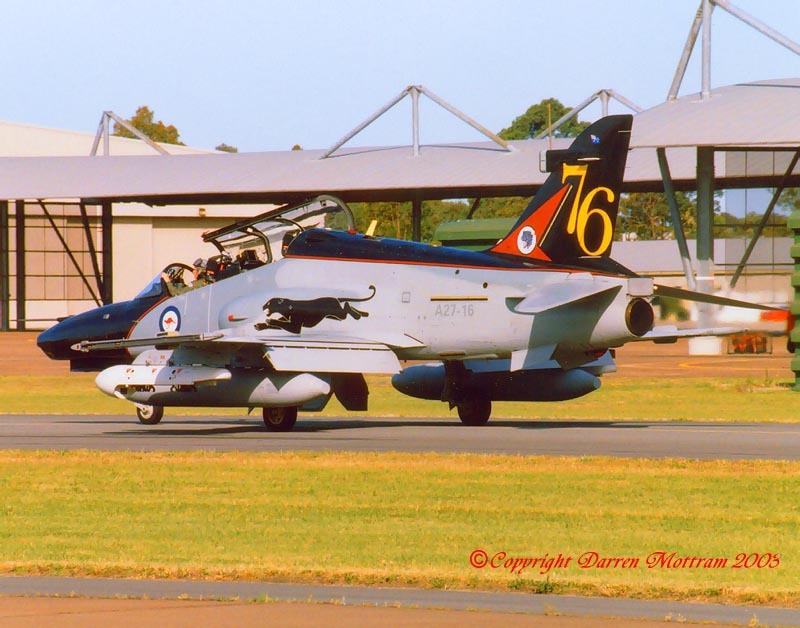 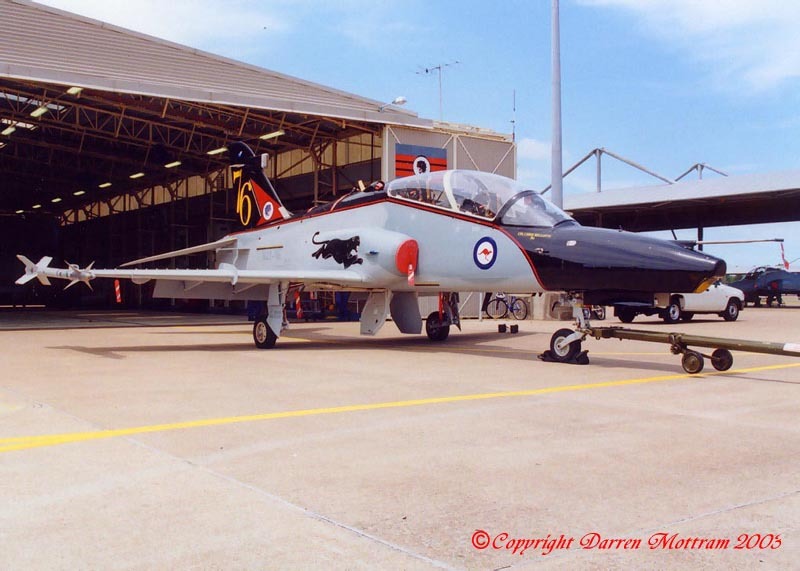 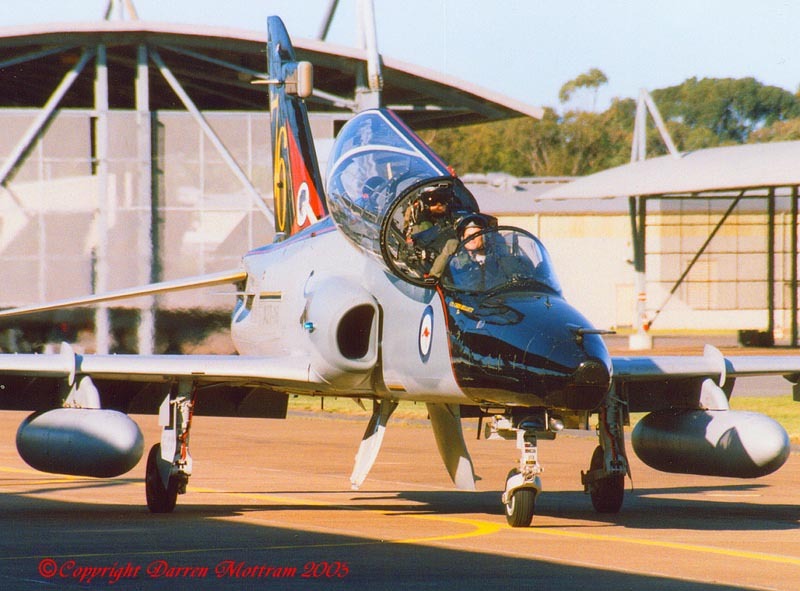 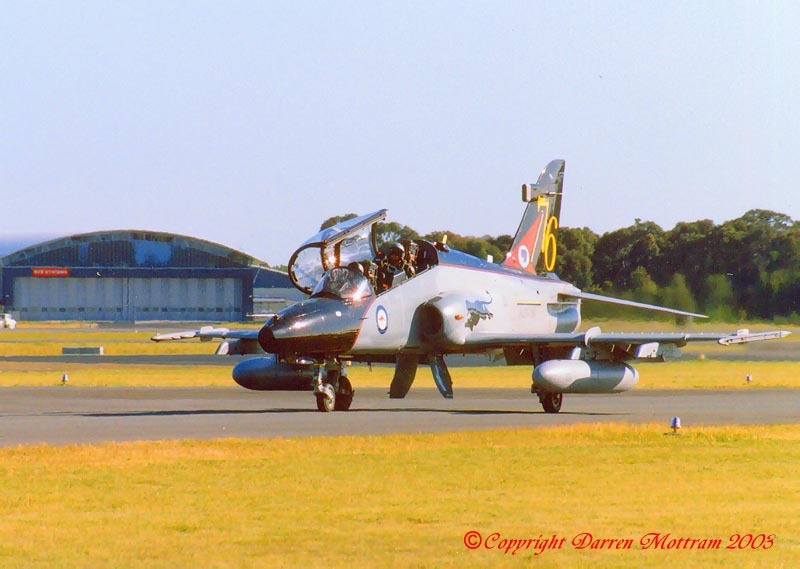 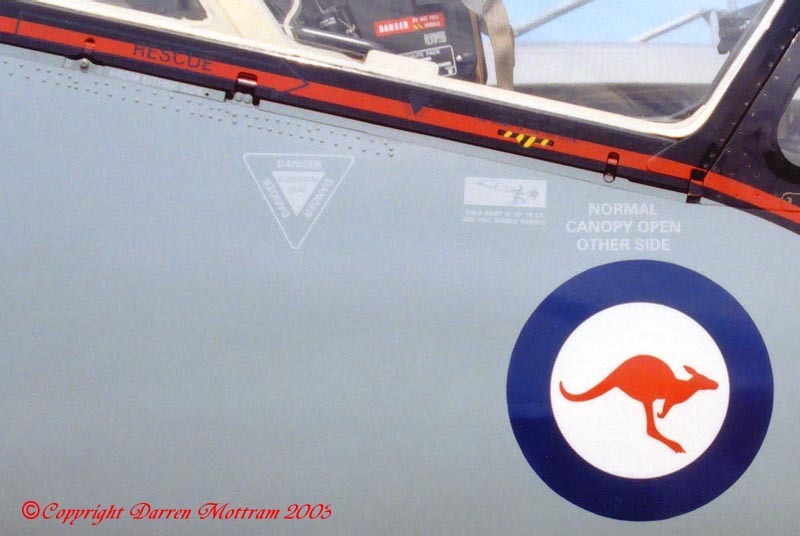 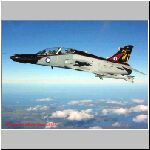 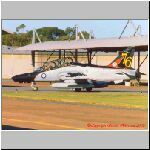 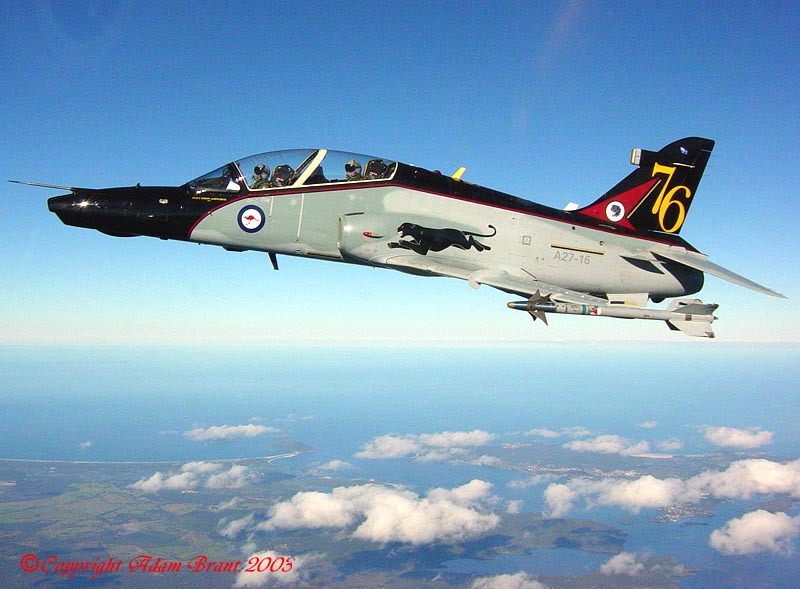 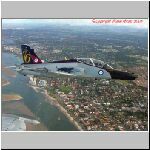 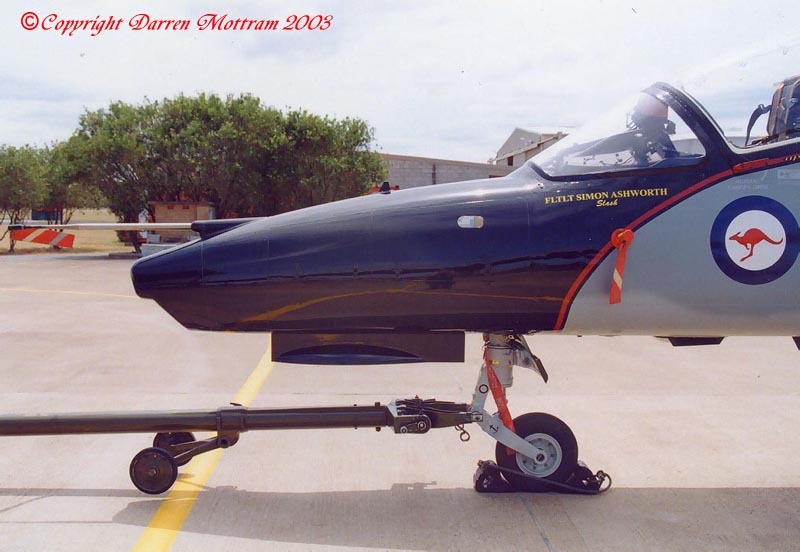 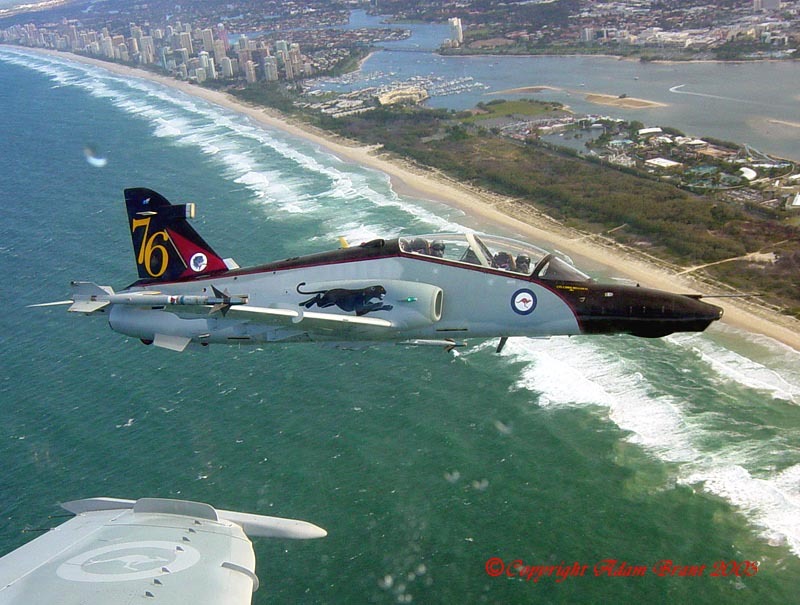 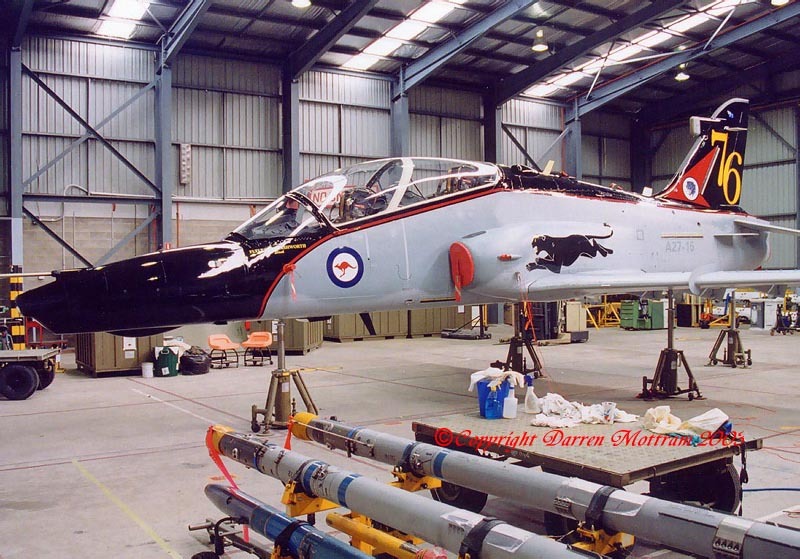 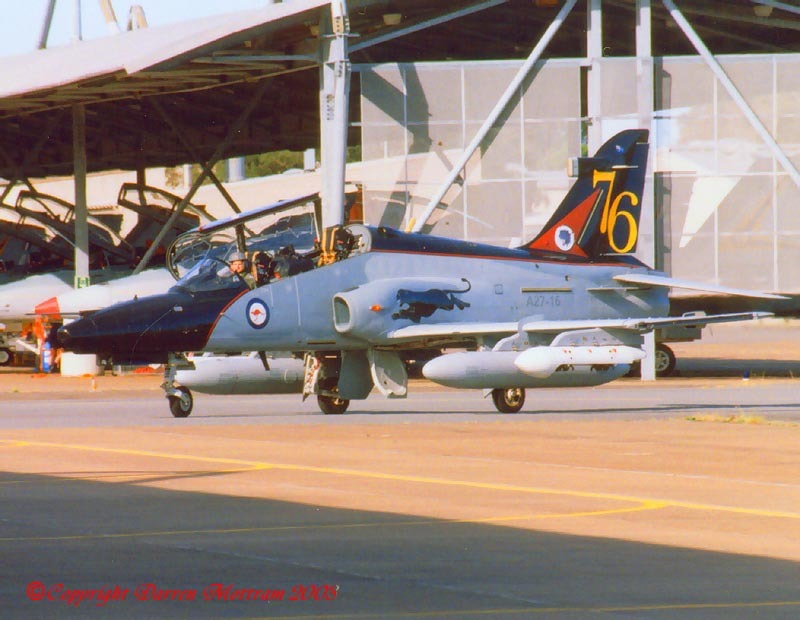 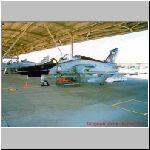 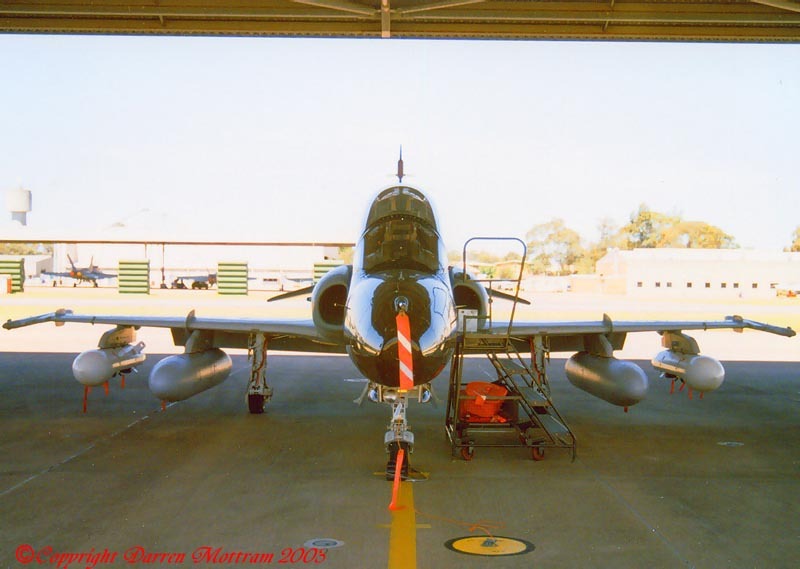 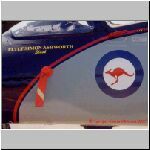 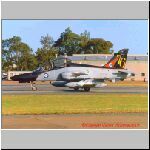 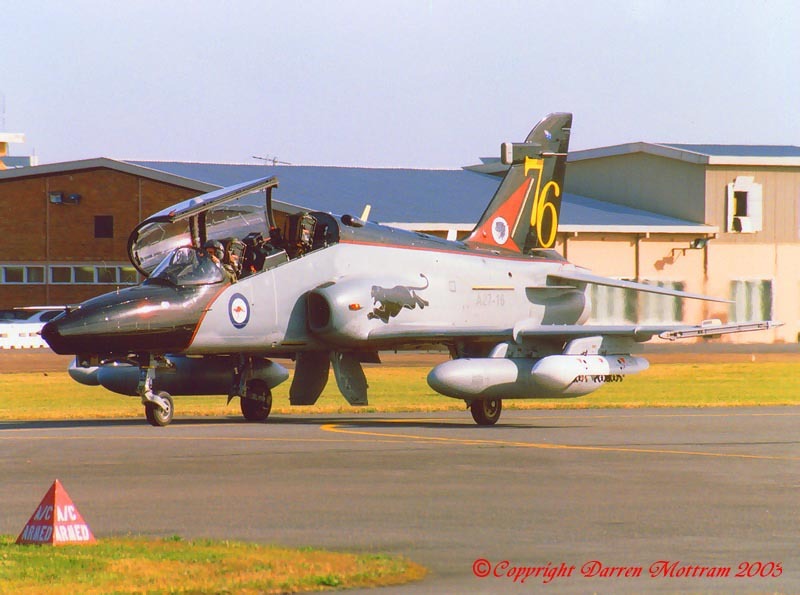 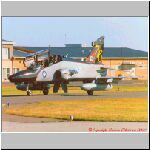 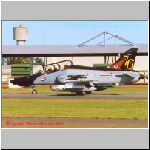 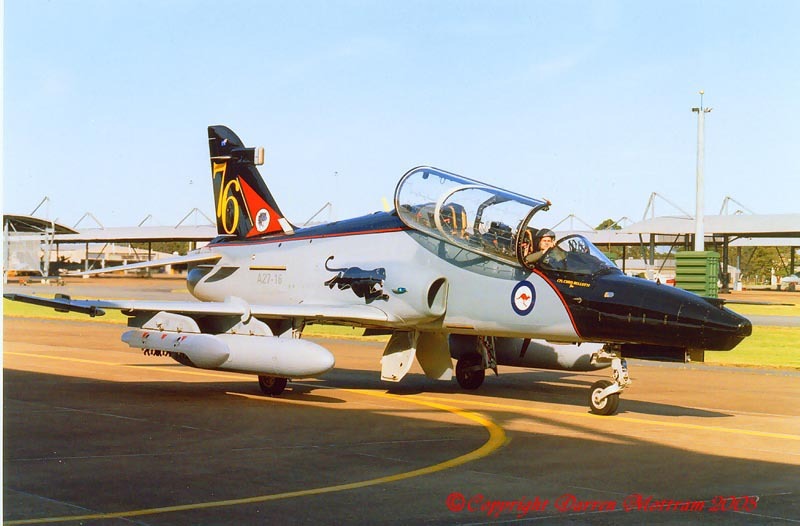 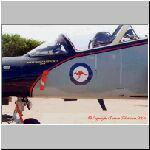 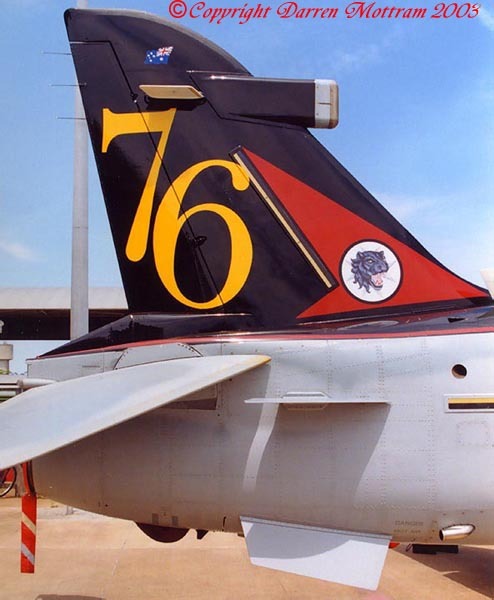 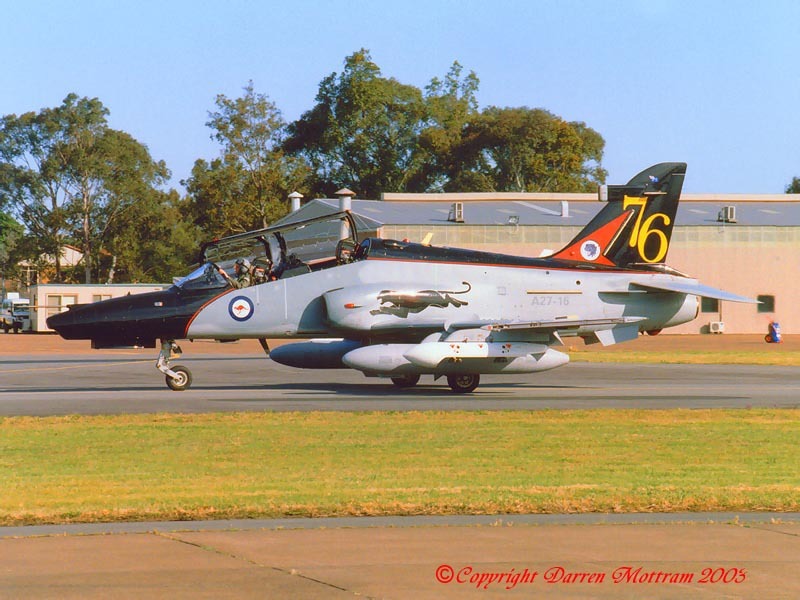 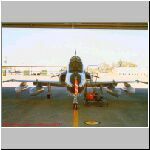 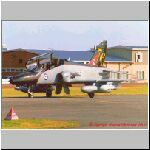 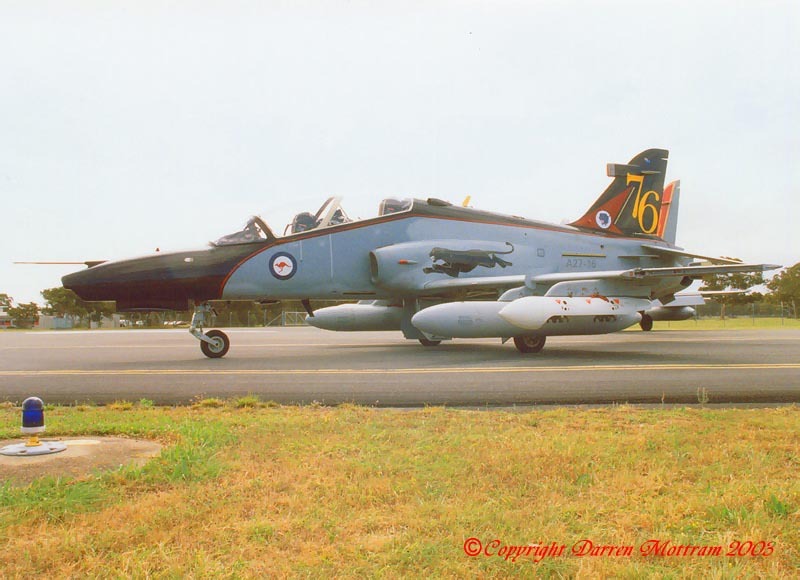 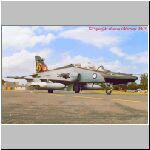 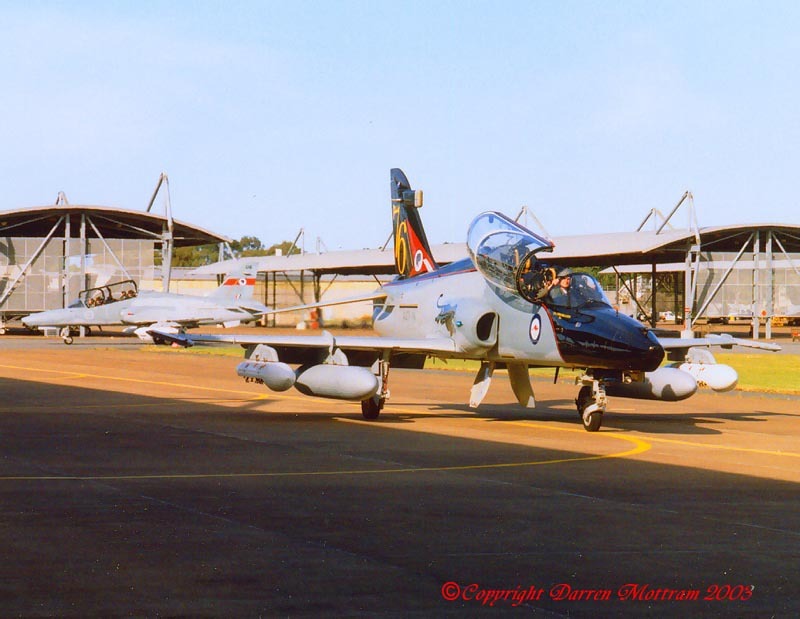 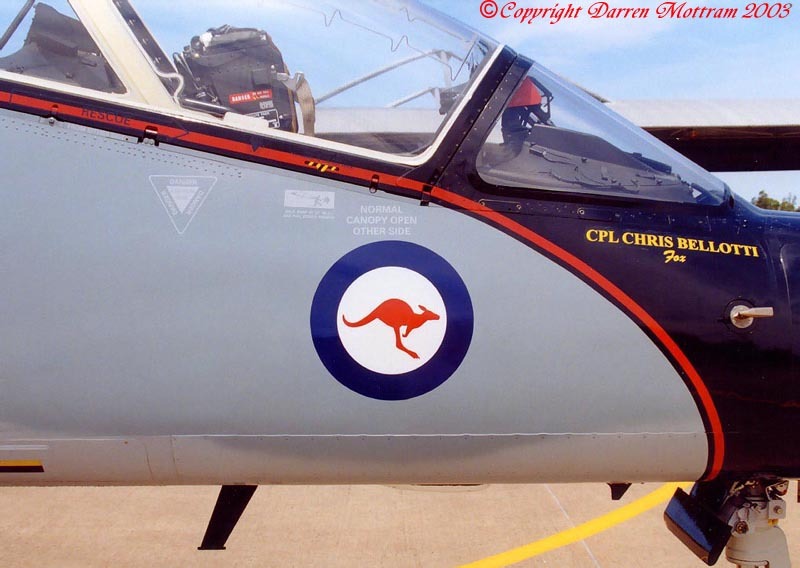 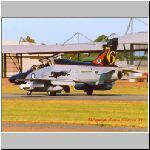 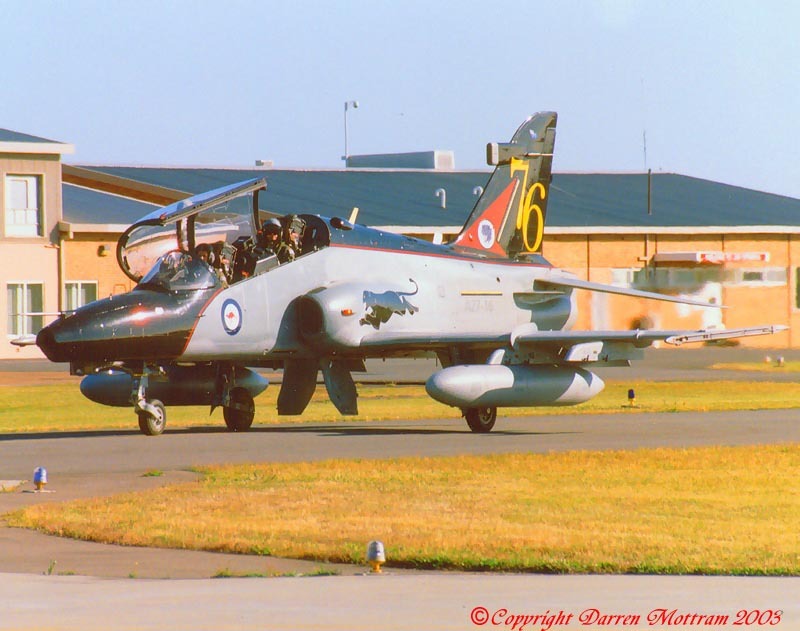 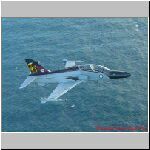 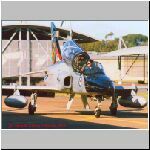 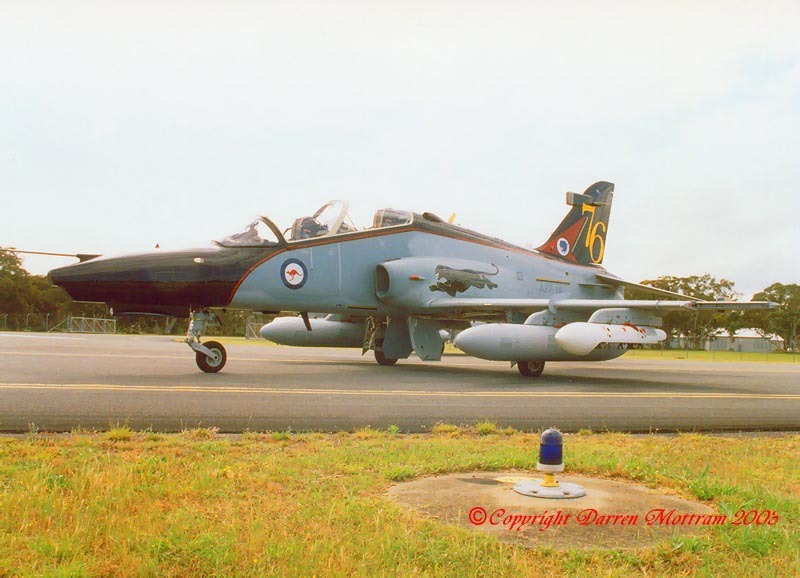 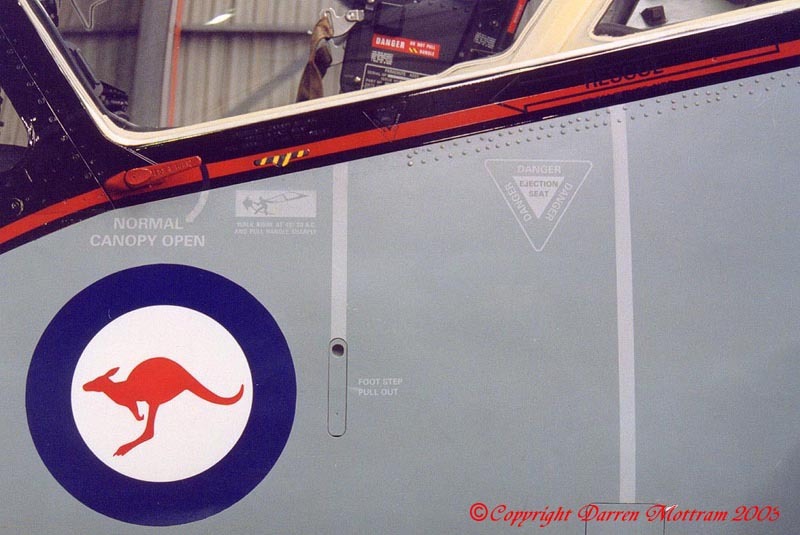 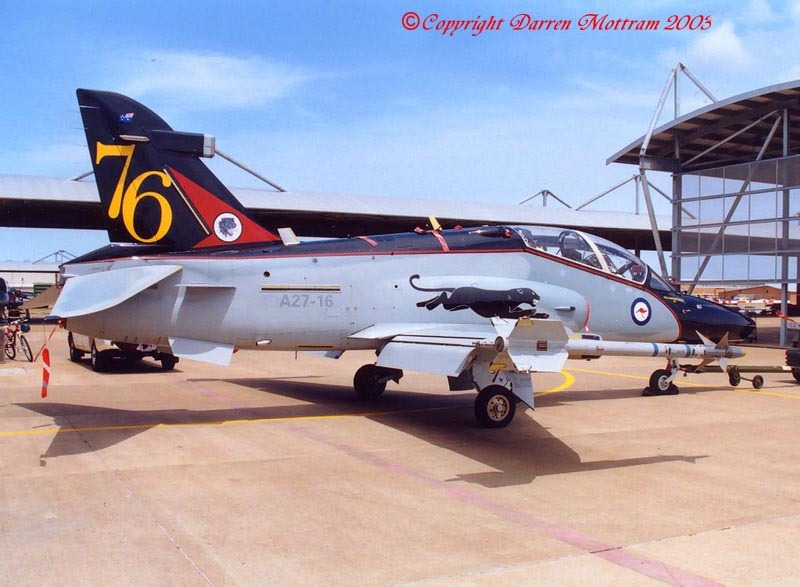 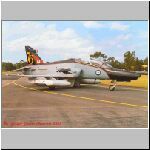 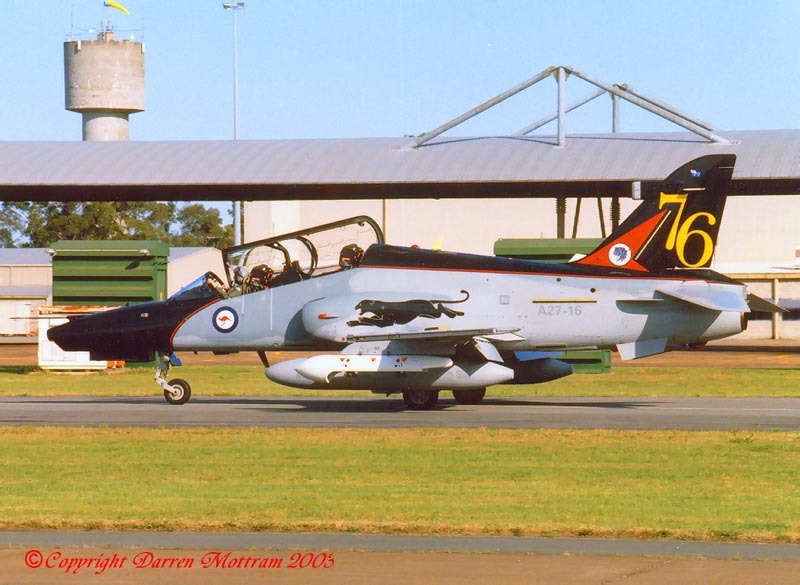 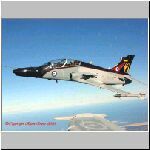 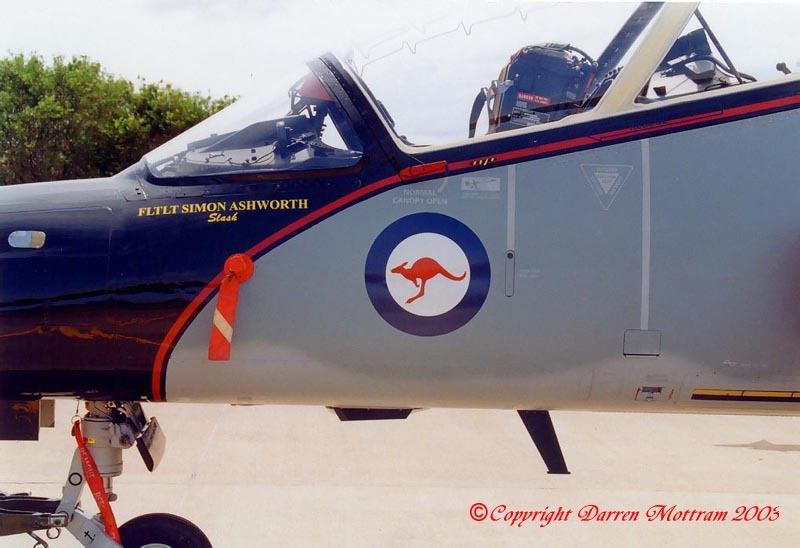 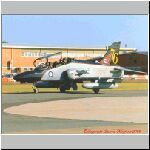 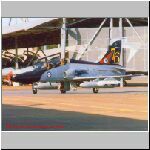 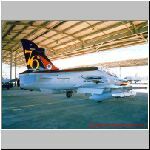 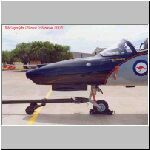 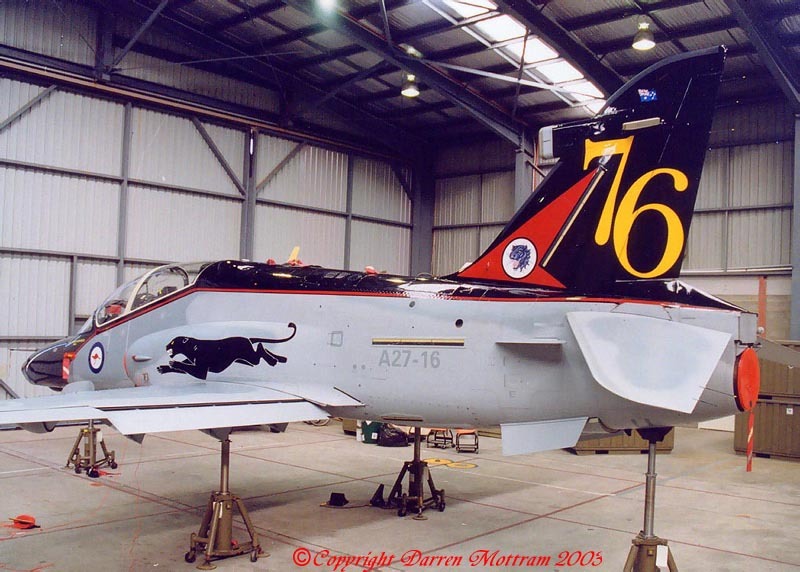 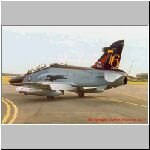 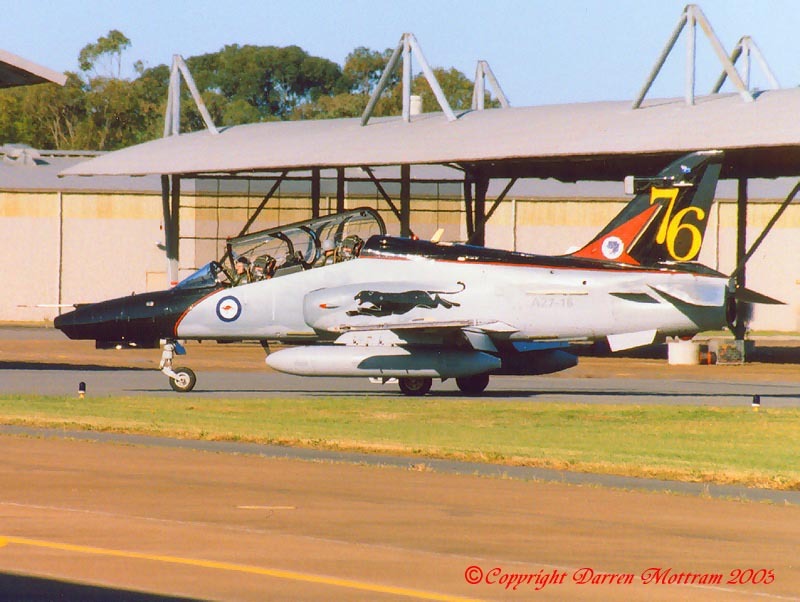 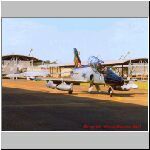 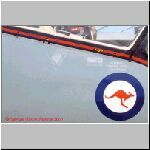 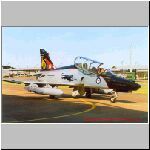 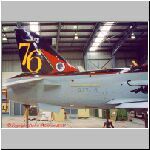 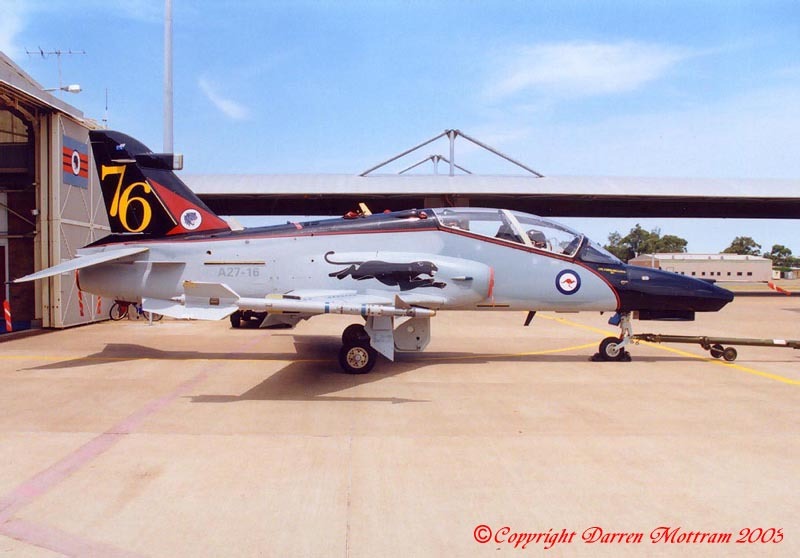 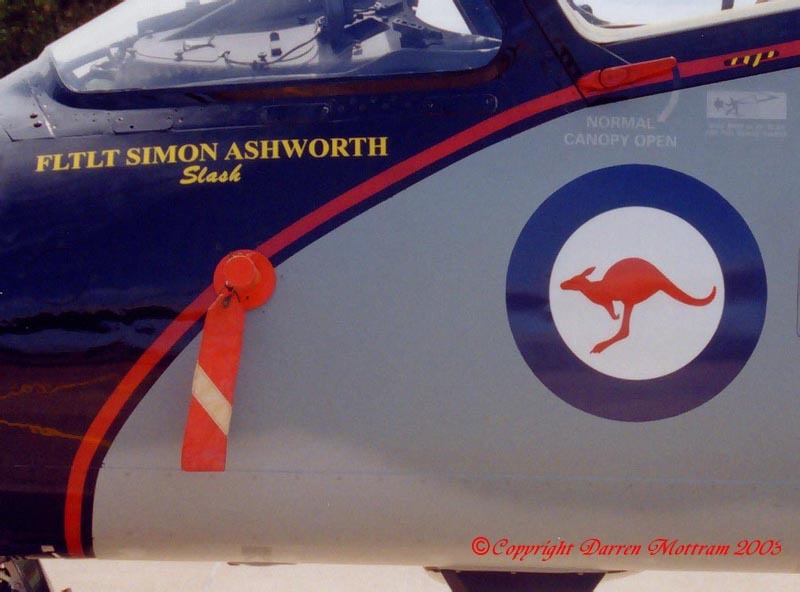 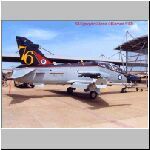 In late 2002 I approached 76 Squadron with the suggestion of applying a high visibility scheme to one of it's new Hawks to enhance the visibility of the aircraft, 76 squadron and the RAAF at the many airshows at which the Hawks were beginning to appear for flight and aerobatic demonstrations. 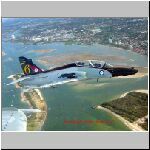 In particular, the then approaching Avalon International Air Show. 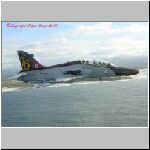 Just before Avalon, in Febrary 2003, the decision was made to apply one of the schemes I had submitted to A27-16. 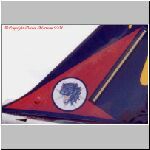 Owing to time constraints, the scheme was not fully applied as intended but, I hope, still makes a colourful change to the more usual grey colours seen on today's millitary aircraft. 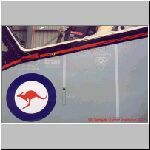 With the recent release in 1/48 scale by Airfix of the Mk 100 series export version of the BAE Systems Hawk and the re-release by Highplanes of their own kit of the Mk 127 LIF, both of which include these markings for A27-16 of 76 Squadron RAAF, I would like to offer those who may wish to model this machine a walk around of the colours and markings as applied to it. 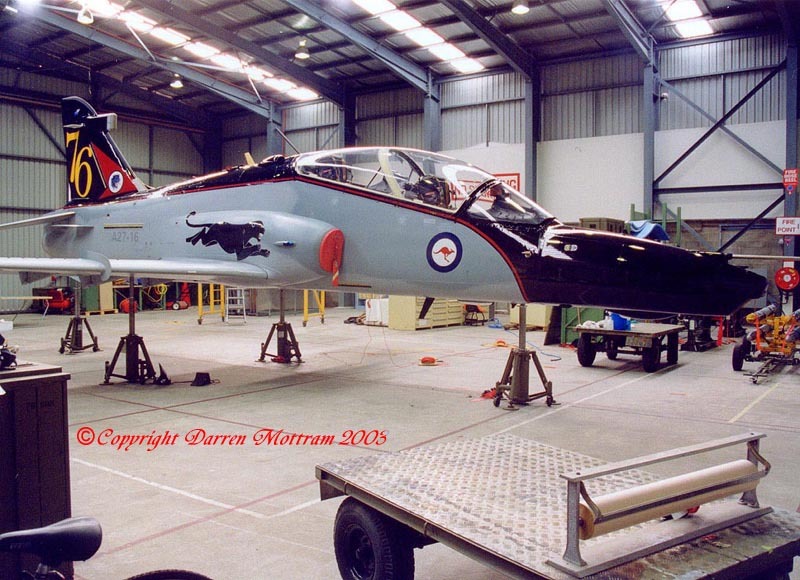 The static photos were taken during the painting process and immediately after the jet was rolled out in Febrary 2003, before it's first flight in the new colours. 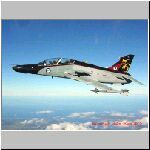 Others were taken in late 2003 and show '16 in Squadron use and carying tanks and stores. 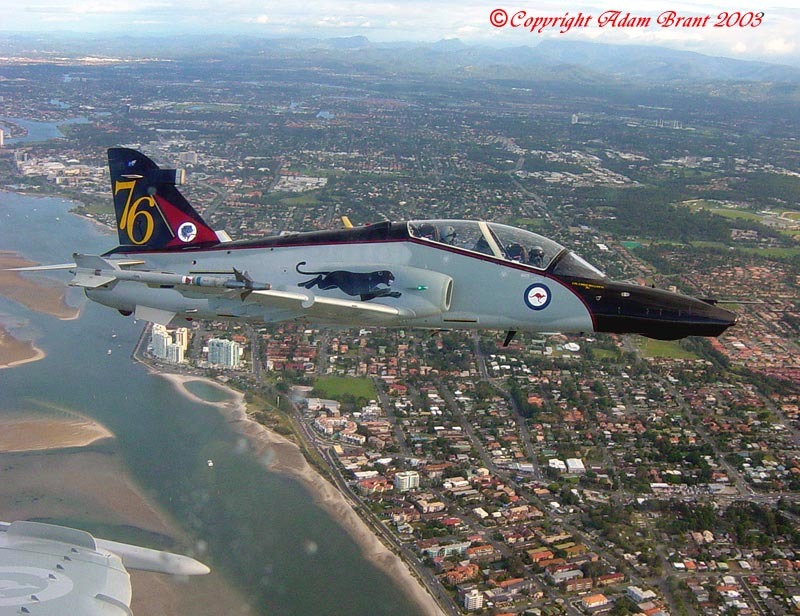 I would like to express my deepest gratitude to the members of 76 Squadron, Royal Australian Air Force (RAAF) and BAE SYSTEMS for giving me the permission and opportunity to be able to share this information with you all, and a special thanks to Adam Brant for allowing me to share some of his stunning air to air images. 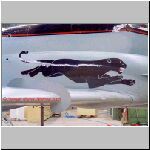 The photos should cover most details but one thing that won't show up too clearly is that all the stencils that fall within the colour area have been applied (in their normal positions) in a hand mixed, *very* dark shade of grey. 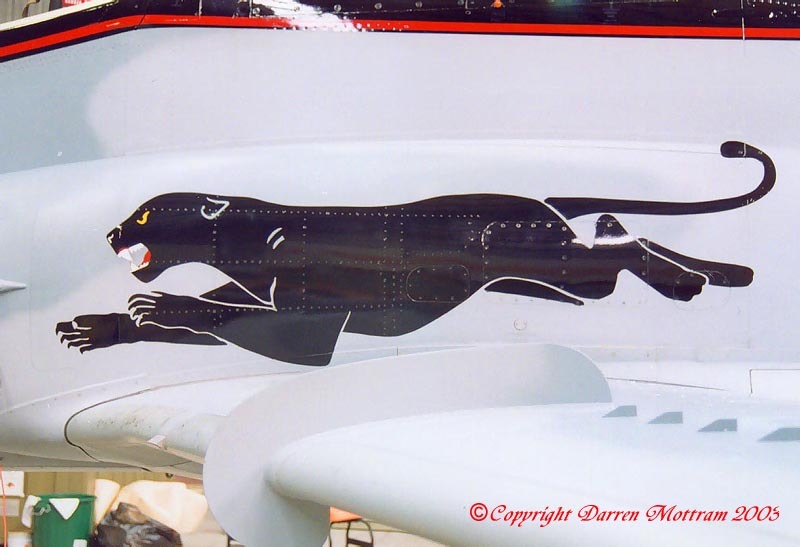 Basically the black, with a couple of drops of white in it. 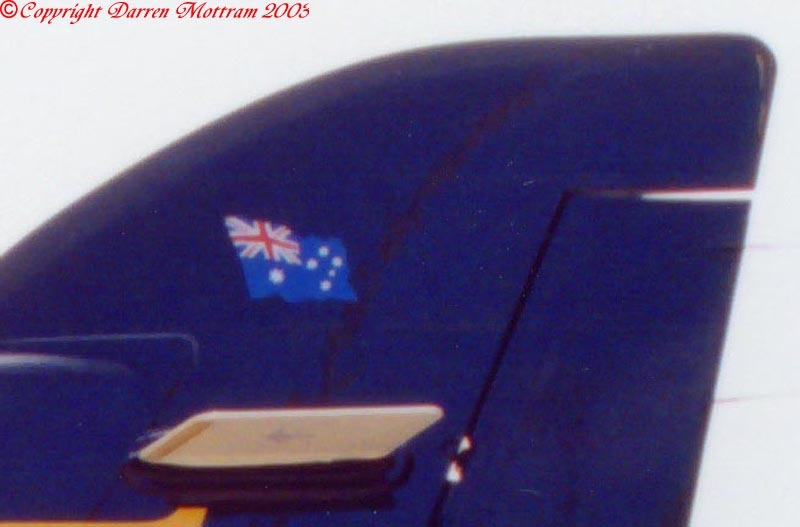 This includes the rescue and danger markings on the canopy rail. 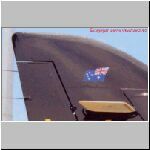 I have adjusted a couple of the photos to hopefully show this. 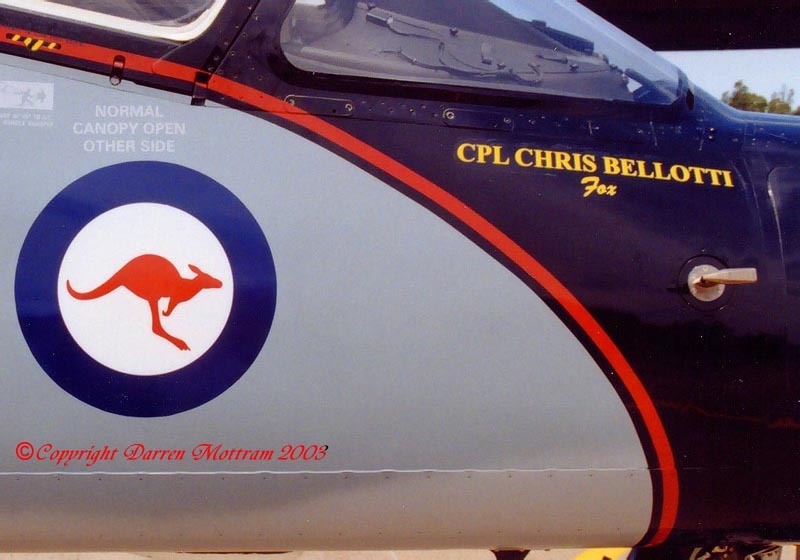 The red was applied over the top of the black and therefore seems to be a little bit darker than a "straight" red (like the Kangaroo in the national marking). 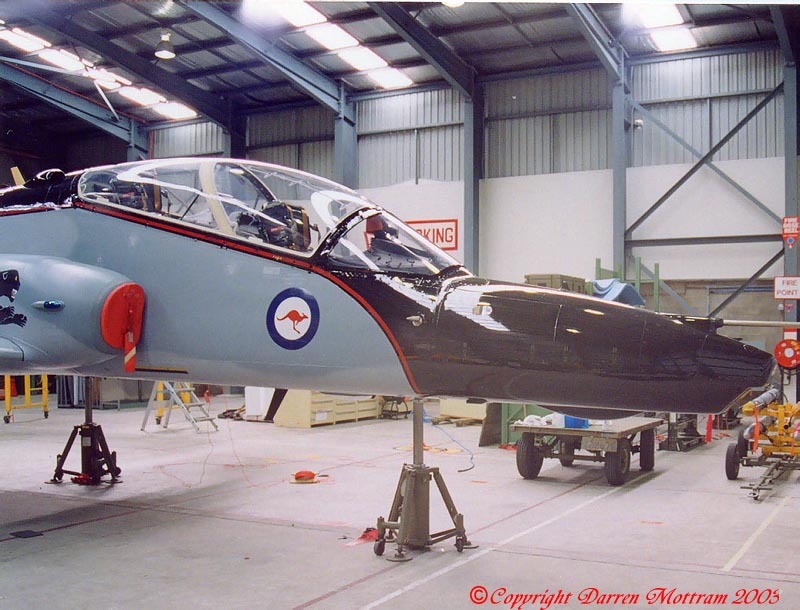 The red striperemains the same to the back end, it just ends up on the flat upper surface of the parachute fairing. 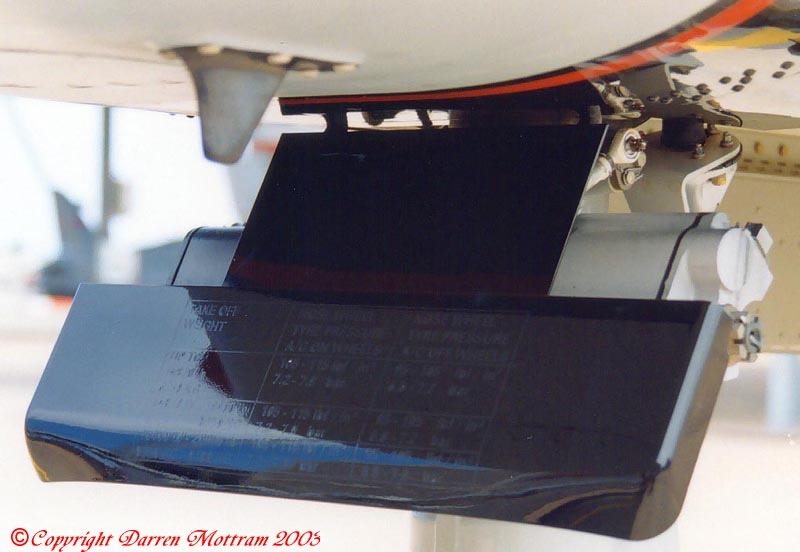 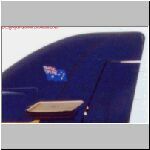 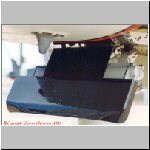 Note also that there is nothing painted on the rotating base plate of the tail plane where the colour/stipe crosses behind it. 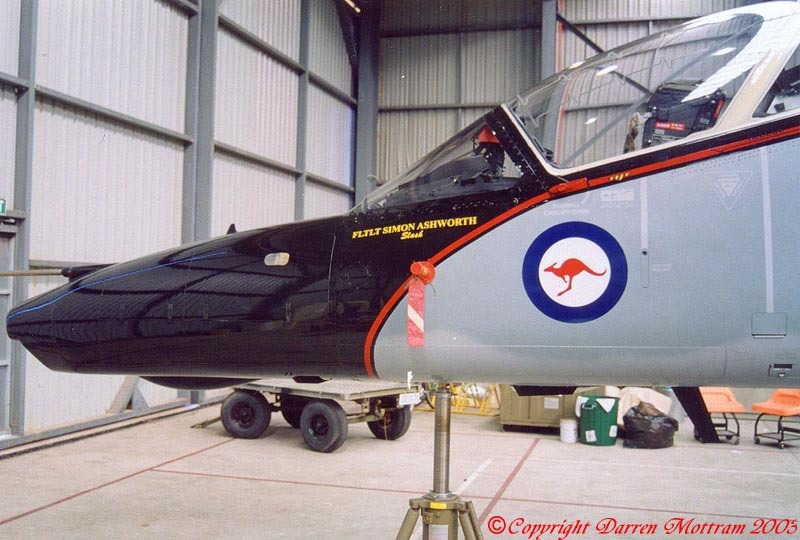 All the new colours are *extremely* glossy. 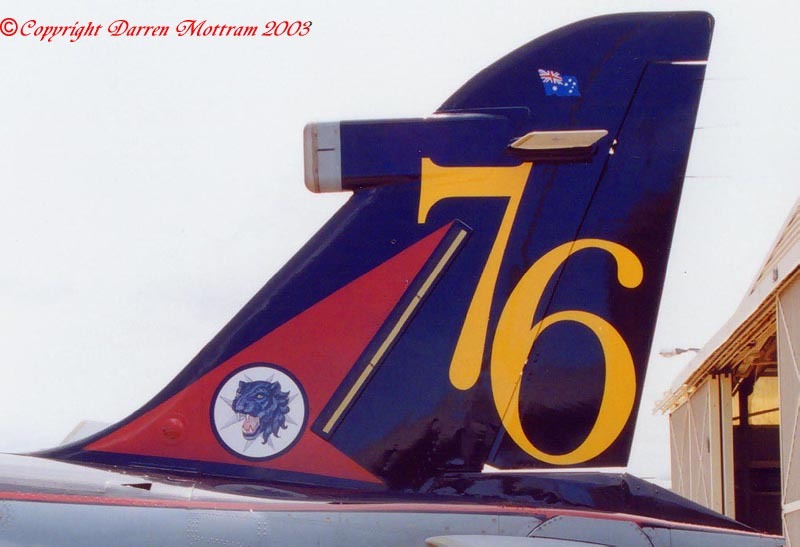 The roundels and the tail badge are exactly the same size as they are on the normal scheme. 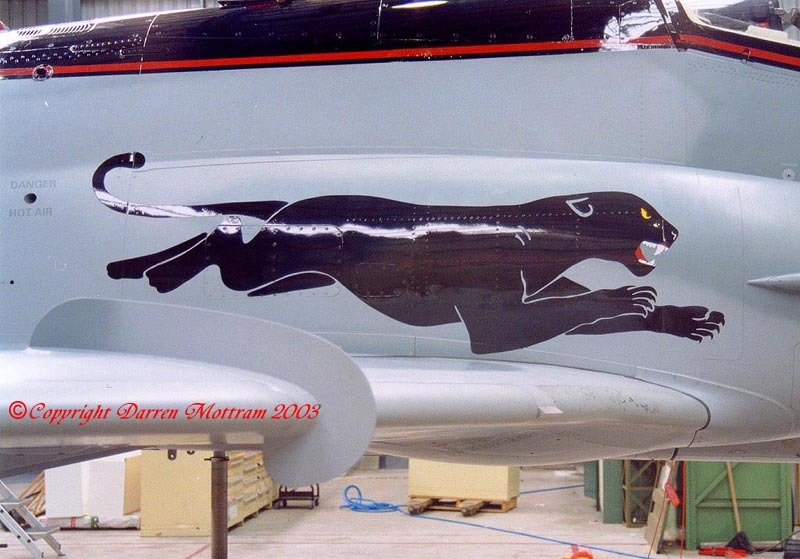 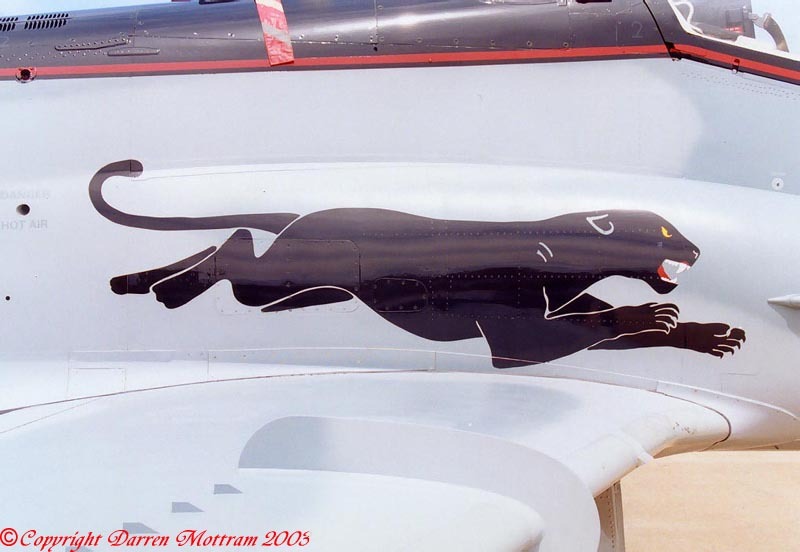 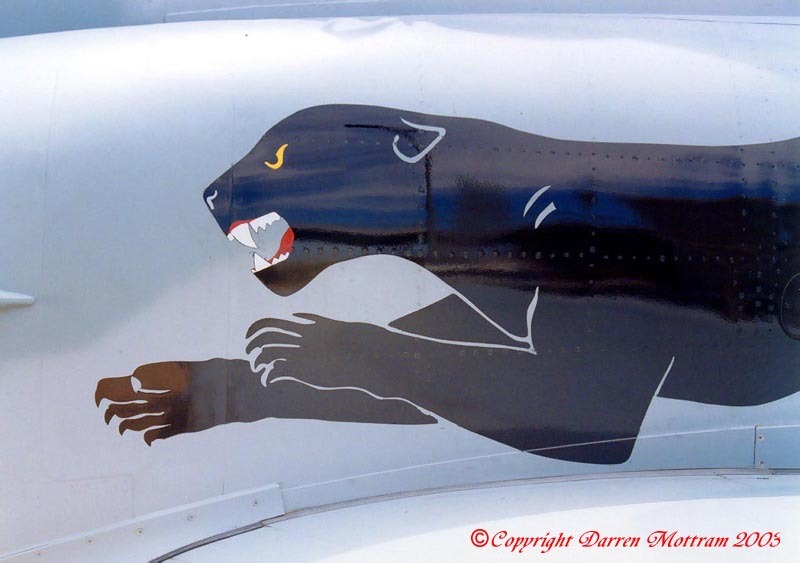 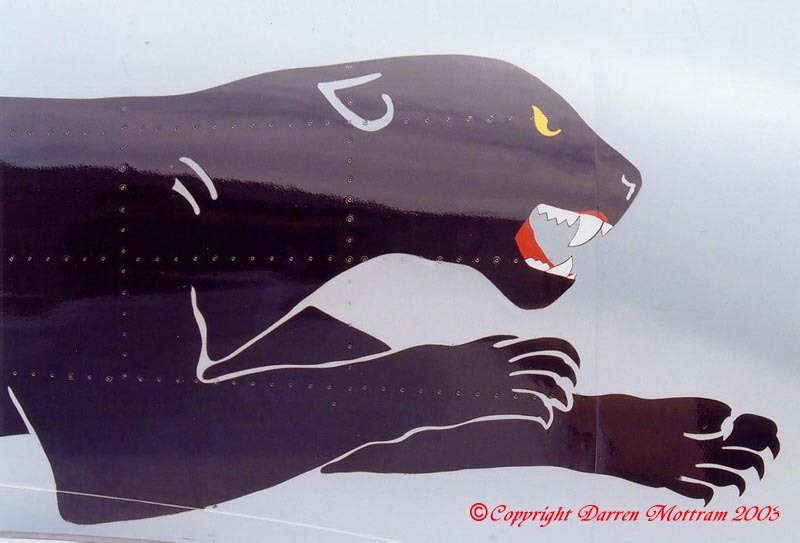 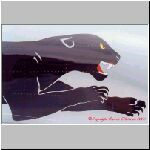 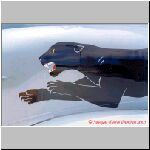 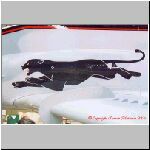 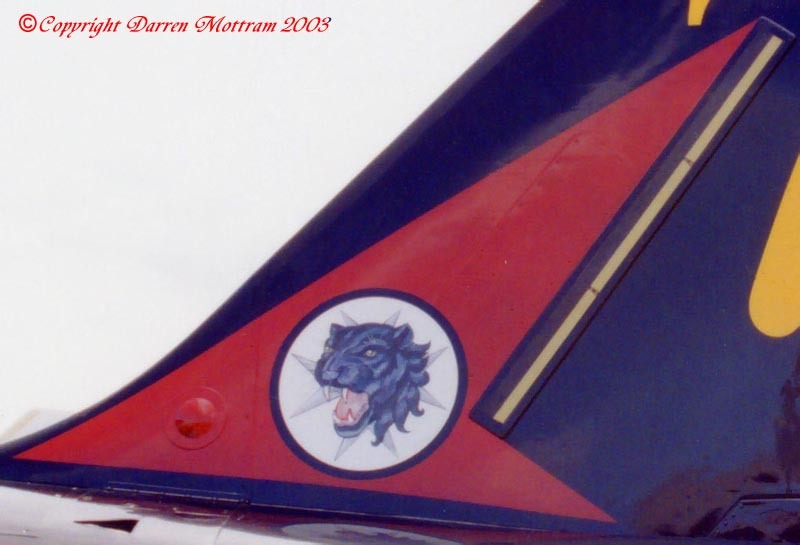 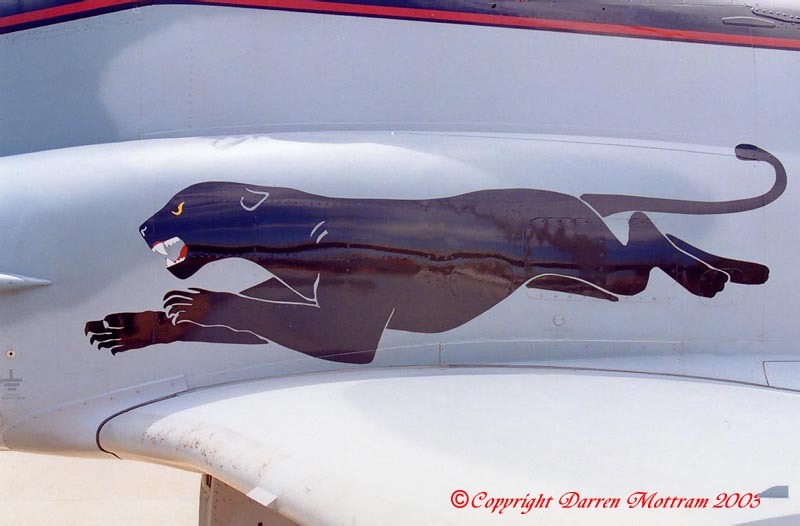 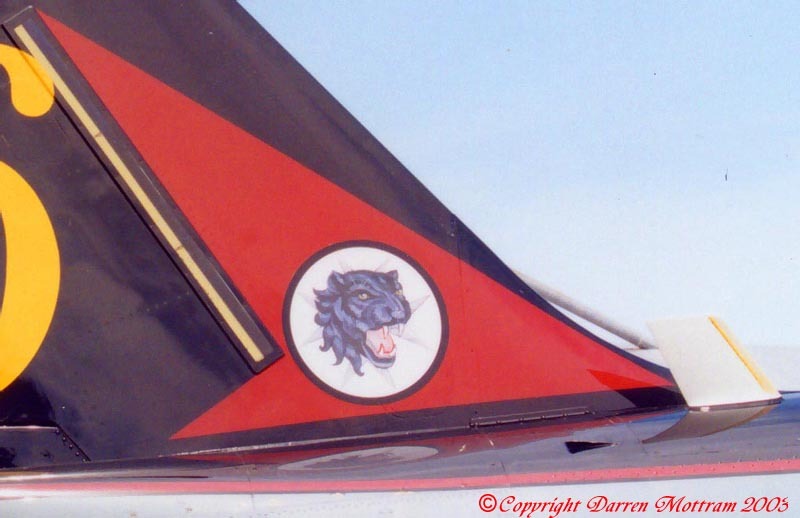 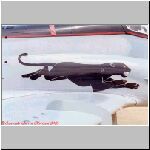 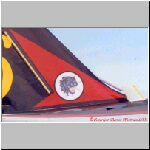 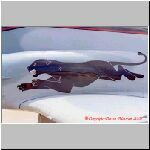 The grey details/lines that define the Panther on the fuselage are just the background colour, so they are just whichever of the two camo greys that happened to fall underneath the image. 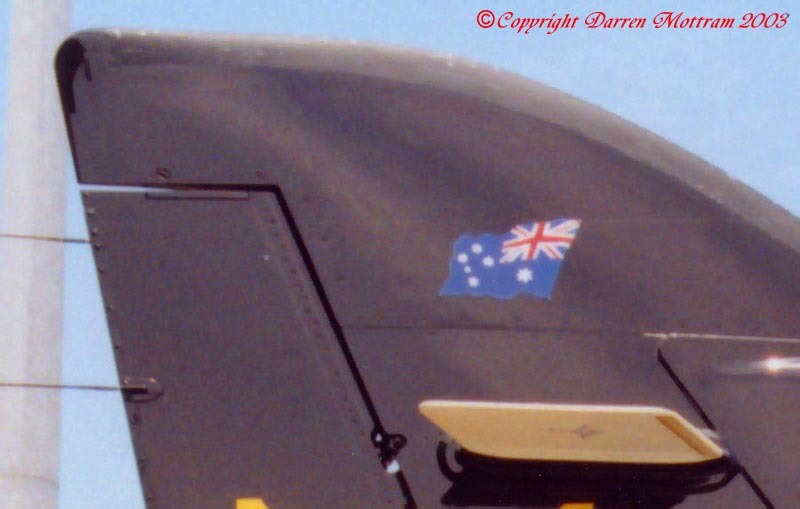 The upper wing roundels are still counter shaded grey. 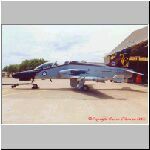 My thanks to the members of 76 Squadron for allowing me the opportunity to take these photos. 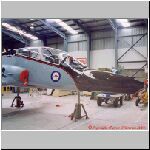 http://motty.hobbyvista.com/Articles/hawkdm_5.html Detailed walk around, including cockpits and stores. 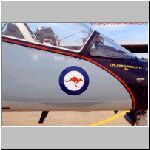 http://www.clubhyper.com/reference/hawkdm_4.htm Coverage of early 76 squadron markings and colours. 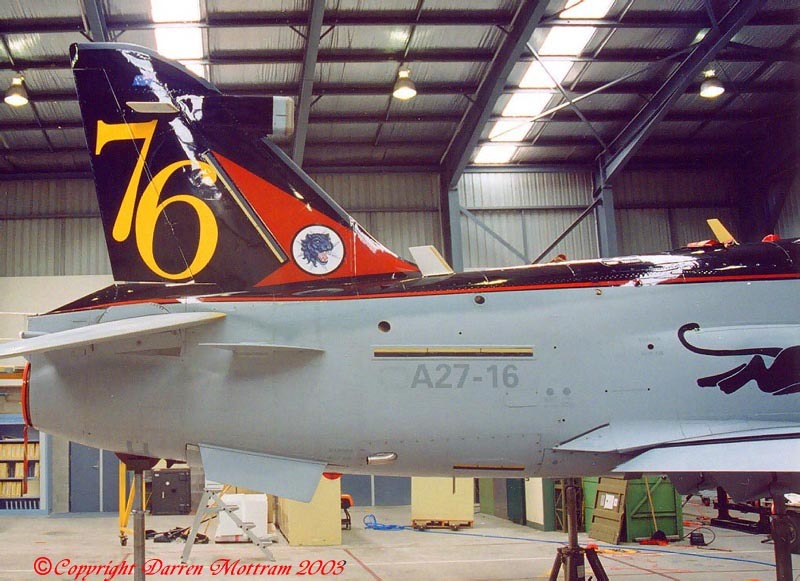 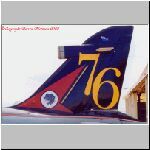 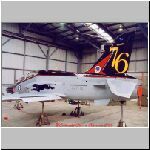 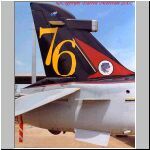 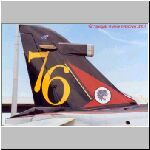 http://www.clubhyper.com/reference/hawkdm_79Sqn-01.html Coverage of 79 squadron markings and colours. 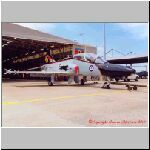 http://motty.hobbyvista.com/Articles/hawkdm_special-schemes-01.html Photo Gallery of A27-16 and A27-21 (specials) together. 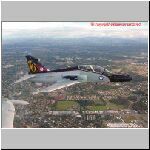 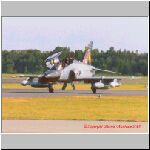 http://motty.hobbyvista.com/Hawk-Articles-01.html All my Hawk articles index.